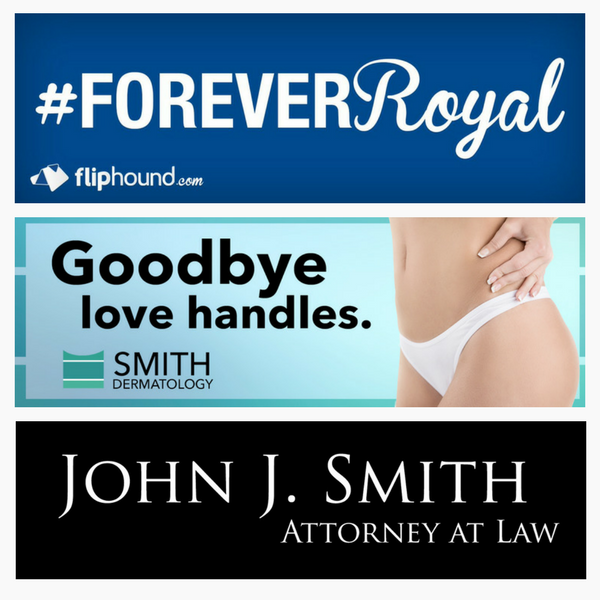 Fliphound has assembled 100's of the best, most creative, memorable, eye-catching and effective outdoor billboard advertisements, ideas, and example ads from national, regional and local advertisers. Out-of-home (OOH) advertising campaigns are designed to capture viewers and motorist attention, and advertisers achieve this through striking, bold imagery and engaging copy. Billboard ads allow you to speak to the same group of people on a daily or weekly basis for the lowest CPM cost - much lower than TV, Radio and Print. To find out how much billboard advertising costs in 600+ cities by zip see Fliphound's Billboard Cost and Impact Calculator. Advertisers and new users can search Fliphound's billboard creative gallery by industry or key word or review examples of some of the most clever, must-see, and effective billboard ads by clicking on the industry links below. Learn how businesses and other organizations use Fliphound to grow and promote their businesses, brands, and products using outdoor advertising. Each page provides insights the advertiser, agency, and other details about the billboard ad. Review our ad galleries and sign up to get started - Fliphound makes billboard advertising easy!